You know how you have a holiday favorite that you make EVERY year. Well, this is mine. 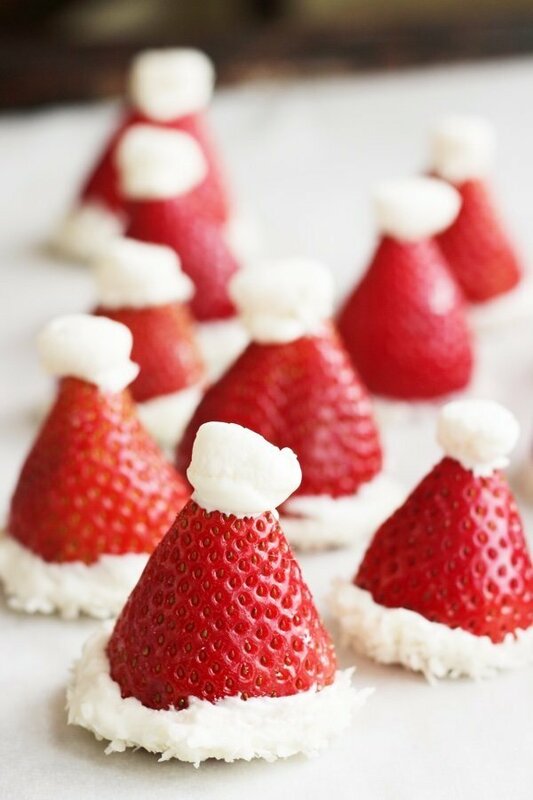 I love this Santa Hat and I can find fresh California strawberries that are tasty in my supermarket. They have gone through an evolution of sorts. Three years ago, I made adorable Santa hats with whipped cream. There were complaints about the top sliding off. Three years ago, I went back to the drawing board and came up with the “new and improved” Santa hat. Again, people loved them! I used part skim ricotta cheese to make them more stable and it works! The key to keeping the hat on is to slice the strawberry very straight so that the hat rests flat. If there is an angle, you will have hat slippage. 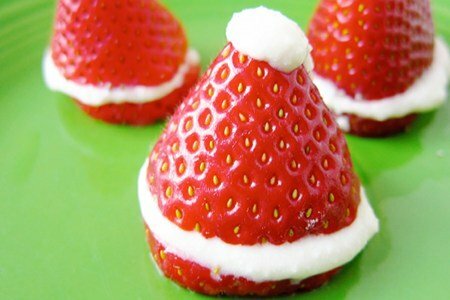 These are also simple to make (not as easy as the whipped cream version) and they will store in your fridge for a party. Just mix up ricotta, sugar, and vanilla and spread it on the strawberry. Do you have a holiday recipe that you make every year? Hull strawberries and slice a small portion off the bottom so that the strawberry will lay flat. Mix together ricotta, sugar, and vanilla. Using a spoon, put filing between the bottom slice and the top slice. Add a dab of filling to the tip of the strawberry. These can be enjoyed immediately or put in the refrigerator to be served later. These will last one day in the fridge. Very cute! I tried these for a holiday gathering last year. Very festive! Thanks for the reminder. Again this year I face all those food challenges...so far my idea for things to take to a potluck include shrimp cocktail and now these strawberries; so at least I'll have something relatively guilt-free to eat! That is so cute! I would dip the tip in a little white Chocolate. I hope I remember this and then I'll take this to next years Christmas party. I don't have a printer, how can I save this on line? This looks so cute! I'm sure my nieces and nephews would love to munch on these. Thanks! I use a slice of banana for the neck and put each one on a short skewer. Less messy I think and nothing to slide. I drip a little lemon juice on the banana slices so they don't turn brown.